This is another post on a bath and bathing product - Body Wash. I have been doing lot of posts on shower gels and body wash, but cant really help it since its really hot here. I know its raining in many parts but here its still very hot. I just finished my Palmolive Thermal Spa Skin Renewal Shower Gel few days back and this Spa Resource Hand & Body Wash was next in the waiting list. SPA Resource is an international brand which provides lot of bath and body care products like hand and body wash, body butter, hand cream, body salts, lip balms, foot care products, body scrub, mist and few other skin care products out of which Coconut Hand Cream, Vanilla Sugar Hand Cream and Very Berry Hand & Body Wash are very popular. The one I am going to review is Tahitian Monoi Hand and Body Wash.
Use as a gentle hand cleanser or all over body wash to keep skin soft, clean and refreshed. Work up lather, massage into skin and rinse. 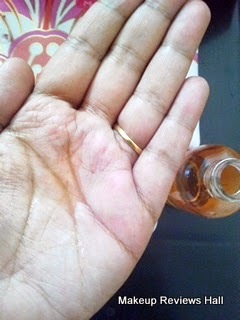 SPA Resource Hand & Body Wash Review. This Spa Resource Hand and Body Wash comes in cute and small transparent round bottle with a simple open close cap unlike flip tops, which are very common these days. Because of no flip, its little time consuming to open and close the cap and also you can’t control truly the amount coming out of the bottle. But in case of traveling, I prefer these kind of bottles because there is no chance of leakage and moreover this being smaller in size is perfect for traveling. The consistency of the shower gel is little thick and only a small drop is required since it lathers very well, giving a squeaky clean skin. The shower gel is light peach in color and has very strong aroma as if made of using different ayurvedic and herbal oils. Because of the fragrance, you might actually feel as if you are in a spa which is filled with thousands of different aromas. Though I don’t like it fragrance but I am satisfied with the fact that these ayurvedic herbal oils would definitely do some good to my skin. 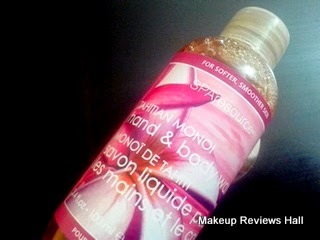 The best thing I like about this Spa Resource Tahitian Monoi Shower gel is that it does not dry out skin at all just like Dove Exfoliating Body Wash. It gives you very clean and nourished skin which does not require any moisturization since the body wash itself does the work of moisturization due to the presence of herbal oils in it. 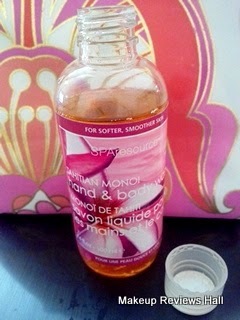 Also you require just a drop of this gel and we all know the less product we use, the better for our skin. Overall I am more than happy with this Spa Resource Hand and Body Wash since it gives a nice shower to my sensitive skin without making it dry at all. Only thing I don't like is its fragrance which I can manage because of the good it does to my skin. I would like to purchase other products from this brand like Very Berry Hand and Body Lotion, Vanilla and sugar Hand Cream but don't know if it would be possible because its not easily available in India. Gives very clean bright skin. No drying of skin at all. Performs dual role of cleaning and moisturization. Very little body wash required. Not in convenient flip packaging.